Pepper died on Saturday and Chilli on Tuesday. I dont know or understand why as they were feeding ok and gaining weight. When I found them both they were laying on there sides and struggeling to get up, they felt cold and they died shortly after. What I cant understand is that they were both perfectly fine and feeding ok an hour or so before they died. They were not feeding off Kimmi but I cant see how that would make a difference if they were being fed science recovery every 2 hours. Popcorn weighs 125g today which is a big improvement as she only weighed 69g last Friday. I am not feeding her science recovery anymore, she is feeding off Kimmi, eating hay, pellets and fruit and vegetables all the time. She is full of energy and is running and pocorning all the time. Apart from her hair loss Popcorn is perfect. And no I will never ever ever breed again! Ive certainly learnt my lesson. It wasnt supposed to be like this at all. If I want anymore guinea pigs in the future I will buy them and definately not breed. I know you meant to say you will *adopt* or *rescue* them, not buy them. To be honest with you, until I came accross this site I never realised how many guinea pigs needed adopting. We dont have a guinea pig rescue near were I live but Im sure they may be some in Tyneside somewhere. We do have a RSPCA about 30 miles away, they may rescue them, but I really dont know. I'm so sorry to hear you lost two more! What an ordeal you've been through. If you would like more piggies, people on this board will help you find them. There is a rabbit rescue in Richmond. They sometimes have guinea pigs, too. I don't know much about it, except that it is there. Its called Bunny Burrows, and they have quite a few guinea's in at the moment. ellissian, please use links to your pictures instead of displaying them with image tags. Your pics are too big to display. And no I will never ever ever breed again! Ive certainly learnt my lesson. What a terrible way to learn a lesson, I'm sorry you've lost so many of them. I hope the remaining one continues to thrive - and hangs in there for you. So glad you've found Guinea Lynx. I know it was an awful way to learn a lesson at the expense of the poor little ones lives. Hopefully Popcorn will be ok, but more of her fur has fell out. Apart from the fur on her head (which feel soft and glossy) the rest of her fur feel very dry and out of condition. Ellissian, I have to be honest with you here. To me, Popcorn doesn't look too good in that photo. I think you really need to find a cavy savvy vet to look at him. Especially after hearing that he's losing more and more hair. That sounds bad. Also, is that iceburg lettuce? I think that's one of the least nutritious lettuces. He probably could use some dark leafy greens as opposed to the iceburg. There's some great info on this site regarding proper nutrition for pigs. Another question, is that pine bedding? That's another no-no. Again, excellent info on here about choosing the right bedding. You said he's nursing? And getting critical care? I hope he is. Seeing that picture really has me concerned though. I'd get him to a vet ASAP. This is just my opinion and I don't want to tell you what to do or make you feel bad. And I'm certainly no expert. Just want to see this little guy be o.k, as I'm sure you do. Another question, is that pine bedding? That's another no-no. Actually, pine bedding if fine if it is kiln dried. Many of us use it. I couldnt tell you if it is pine bedding or not as the packaging doesnt state what it is. Although I had read somewhere about the dangers. We only have two vets in the town I live in and the one I go to is listed as being an accredited exotic vets. So I dont really know what to to with her as they told me not to go back till Thursday, as she thinks her fur loss is stress related or because she hasnt had enough colostrum. Yes she is still feeding from Kimmi and no I am no longer feeding science recovery as she was gaining so much weight on the food she is eating. Her fur isnt shiny at all but she has bags of energy so I dont know what to do for her. Maybe it may be because she didnt get the best start in life and I fed her incorrect food for the 1st week of her life. I really dont know what could be wrong with her fur and what to do with the vets. So any advice on her fur condition would be appreciated. 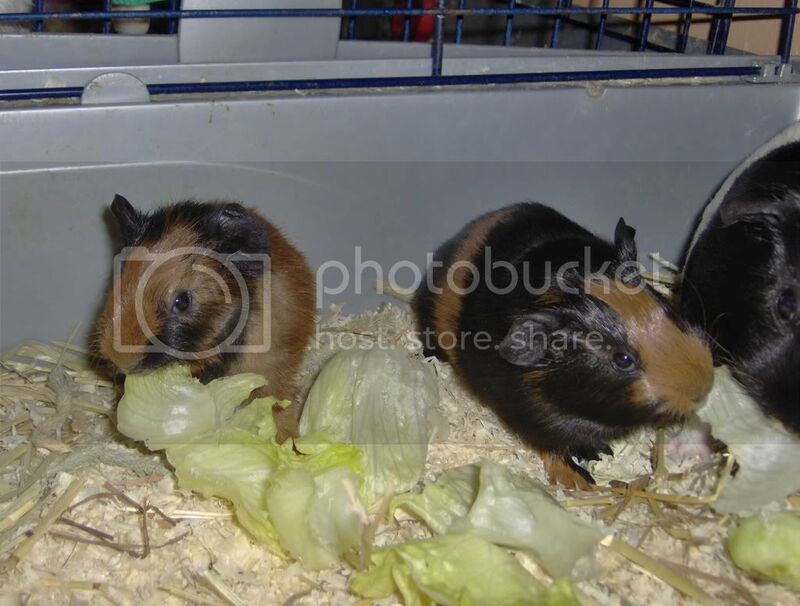 I dont feed them iceburg lettuce in large quantities since I read from this site that it has little nutrition in it. Her favourite seems to be cucumber and dandilion greens. But there isnt many greens around since its winter. I have used pine bedding. You can always air it out if you're worried. Do you think she could be lacking in vitamins? I have this guinea pig vitamin solution. Do you think I should syringe her some? 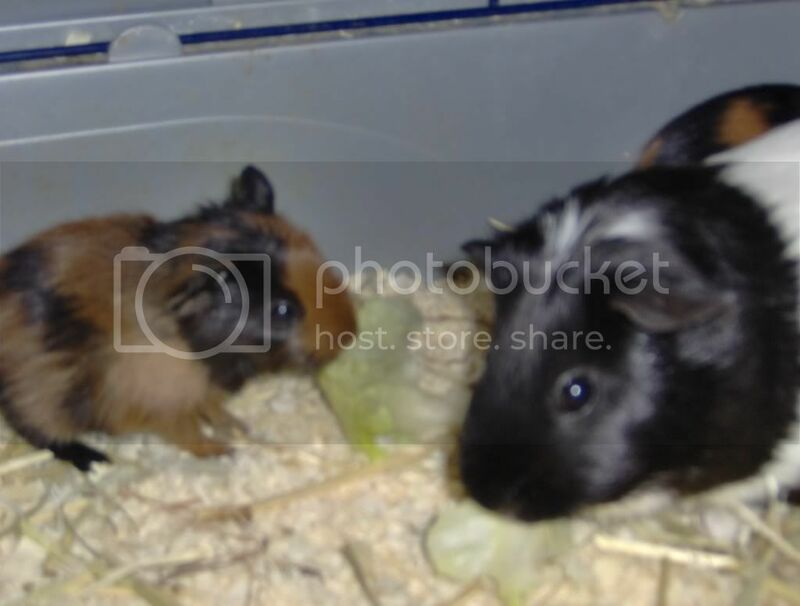 The only vitamin supplement guinea pigs need is C.
Avoid iceberg lettuce altogether. It can cause diarrhea. Try rommaine or green leaf lettuce instead. I would avoid any vitamin solution-- if you want to supplement, you need *plain* vitamin C. The other vitamins often found in vitamin drops can actually do more harm than good as guinea pigs do not need excess of many of the vitamins found in those drops. Do you think syringing vitamin C would help her fur or not?